The 6S powered 600ESP collective pitch electric RC helicopter is perfectly suited to the average collective pitch RC helicopter pilot who doesn't need gobs & gobs of power; but would rather just have a decent sized, reliable, economical, and enjoyably predictable sport/light 3D electric powered helicopter to fly. Many people who have learned to fly collective pitch on a 450 size helicopter, really enjoy progressing to the 600 ESP for their next machine. It's a nice way to get into a larger bird, for a modest investment. The 600 ESP design is also one of the best ever set of electric mechanics for 600/50 size scale projects. This is the primary reason I like them so much and why I'm selling them. Please note: Phoenixtech have been having limited production runs of these kits this year (2019). As such, I have a waiting list of customers and the kits are all spoken for before I get my stock order. If you are interested in one of these kits and they are showing as "sold out", and you don't mind waiting for the next product run/shipment. Please contact me using the form on the bottom of this page to be put on the waiting list. I don't charge a deposit fee for this because there are currently more people waiting than there are kits available at this time. Phoenixtech has lost their canopy supplier and chances are will not be sourcing another. As most of my customers are getting these kits for scale projects and don't need a canopy, this is not too much of an issue. If you do need a canopy however, I show a couple options on the bottom of my 600 components page. To learn more about this 600 ESP heli and why 600ESP's continue to have such a loyal following, here is my full review. The eBook PDF download links are sent to you automatically when the helicopter order is placed along with the the 600ESP Build Instructions & my personal PT 600 ESP Building Tips PDF. Special offer: All kits also include the optional main shaft 3RD bearing block upgrade at no additional charge (a $15.00 USD value). I also have full build videos below on this page if you want to see the entire build process of one of these kits. Shipping is free within Canada (Canada Post Regular Parcel). There is a $20 USD flat rate shipping charge for all continental US addresses including Alaska & Hawaii (Canada Post Expedited-USA). NOTE: Please ensure your correct shipping address on the PayPal checkout screen including your name, mailing address, postal/zip code, country & PHONE NUMBER. I ship Canada Post Monday through Friday, making a daily trip to the post office. All orders usually ship the next business day. I personally inspect the contents of each kit before I mail it out and will send you the tracking number afterwards. Sorry - I'm only shipping within Canada and the United States. International shipping charges have become too costly, along with increasingly high import fees and GDPR restrictions. All Kits & Parts sold within Canada are subject to 5% GST which is automatically calculated during checkout. If for any reason you are unhappy with your 600 ESP kit purchase and would like to return it for a full refund (excludes shipping) you may do so within 30 days from the day you received your order (based on shipment tracking). 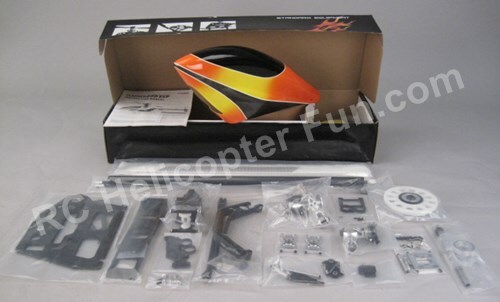 The helicopter kit/s must be in the same condition you received it/them in (all bags unopened - no parts missing) and shipped back double boxed just as it was received or it will not be accepted for return. You will be responsible for return shipping costs and I recommend a tracked shipping method with delivery confirmation as I am not responsible for lost shipments. Your PayPal account will be credited when I receive the kit back. Please contact me first to obtain an RMA (returned merchandise authorization) number. Please note, if you order any spare parts with the kit, I will include them in the box and there will be no additional shipping charges. Just add the parts to your shopping cart before you checkout to take advantage of the savings. Computerized Radio/Transmitter (6-channel or more with helicopter programming). Receiver (6-channel or more full function or satellite/bus if using compatible FBL unit). 3 high torque digital cyclic servos. 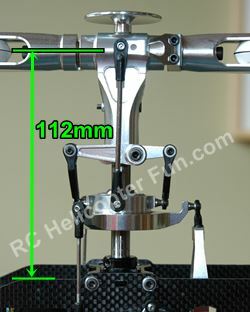 Torque: 166 oz-in (12.00 kg-cm) or higher. Speed: 0.12 sec/60° or faster. 1 high speed digital tail specific servo. Torque: 70 oz-in (5.00 kg-cm) or higher. Speed: 0.06 sec/60° or faster. Brushless ESC with heli programming/programming card (6S LiPo 100A minimum). 600 size brushless motor / 1100-1250 KV (with 6S setup) / 25mm bolt spacing / 6mm dia shaft 20-22mm long. 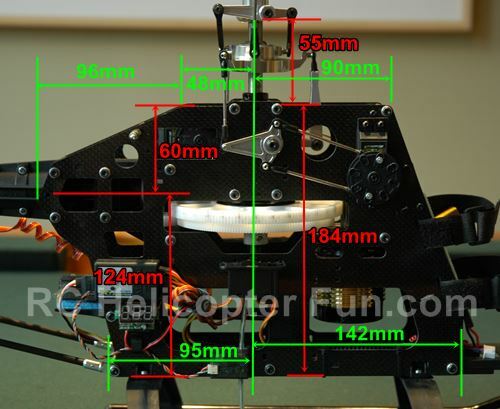 Motor can't be larger than 53mm in diameter (frame spacing is 54mm). 7A or higher BEC, or 2S LiFe/LiPo RX battery. 6S LiPo (5000 mAh - 6000 mAh 30C or better for 6S setup). If you are not too sure what components to pare with this kit; I have some examples for various budget levels on my 600ESP Component Suggestions Page. As many know, the 600ESP remains to be one of the best set of off the shelf mechanics ever for electric powered 600 size scale builds. The above dimensions are the critical ones you may need to ensure these mechanics will fit your particular scale fuselage. Over and above the fact there is no unsightly anti-rotation bracket to deal with; the other big "scale" advantage with 600ESP mechanics is the aileron and pitch swashplate ears are at the rear of the swash with the elevator ear at the front. Why is this "swash ear" positioning an advantage with scale? In most scale applications, there is simply more room (width) at the rear of the doghouse to accommodate the left and right swash ears as shown in the photo below. 600 ESP Has Preferred Swashplate Ear Placement For Scale Applications - No unsightly anti-rotoation bracket either! If those two ears were at the front, you would have to grind a fair amount of the doghouse away for swashplate & pushrod clearance. One of my 600 ESP customer's scale AS350 with custom tri-blade scale rotor head - Stunning Job! If you have any questions about these 600 ESP kits, before or after you purchase one - I'm here to help. Contact me, or use the form below. 600ESP Has A Large Visual "Foot Print"
Video below is one of these 600 ESP kits inside a FunKey 50/600 size Agusta 109A Fuselage. A special customer requested this custom build. If you are curious about what is involved in fitting 600ESP mechanics into a fuselage, in this video, I go over some of the basics with a Funkey Airwolf / Bell 222 build. 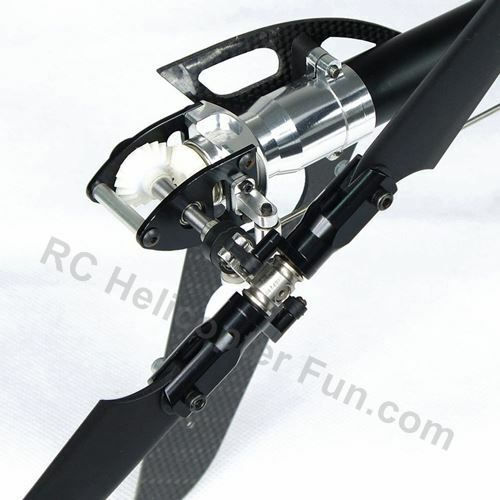 This RC model helicopter kit is not a TOY! It is a high-tech & high performance product that has to be given the utmost respect and care by that of the operator. Improper use of this product can result in property damage and serious injury or death. 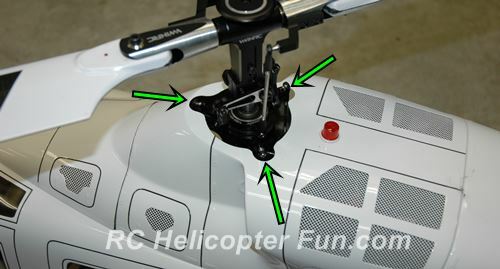 Rotating components, especially the main & tail rotor blades, are an ever present danger. 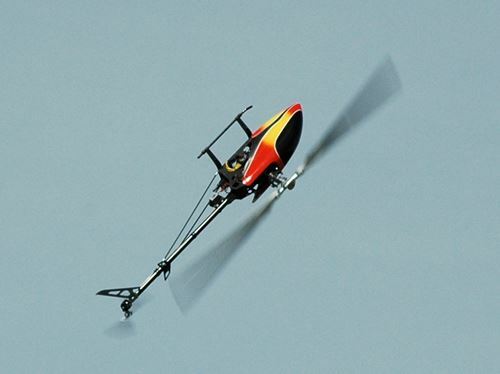 Model helicopters operate differently than model cars and airplanes. Helicopters by their nature are not positively stable, meaning that even when properly assembled and trimmed, helicopters will not recover from an unwanted flight attitude, nor will they hold any particular orientation without constant control inputs from the pilot. 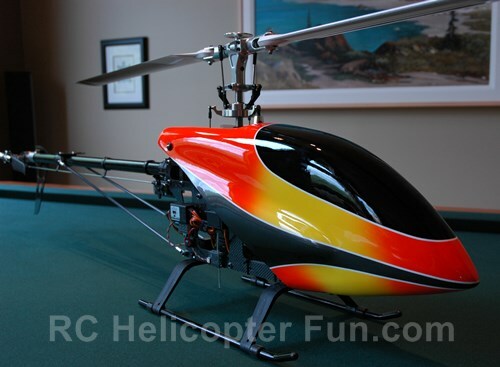 This RC helicopter is therefore intended for adults with EXPERIENCE FLYING COLLECTIVE PITCH RADIO CONTROLLED HELICOPTERS at a legal or similar open & large flying field/location well away from spectators, buildings, traffic, etc. Fly in good weather conditions with good visibility and never fly beyond your skill level. Obey all restrictions, laws, and RC model registrations as they apply to flying RC aircraft in your area. 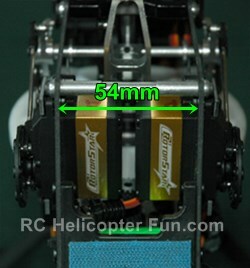 IT IS YOUR EXCLUSIVE RESPONSIBILITY TO PROPERLY BUILD, MAINTAIN, AND OPERATE ANY RC HELICOPTER. 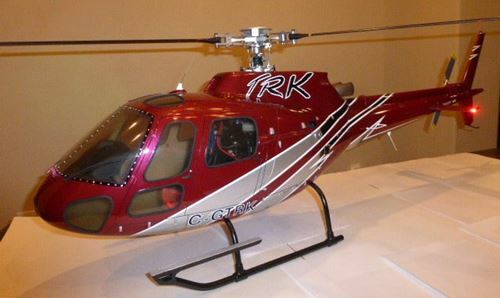 Because the safe & legal operation of this helicopter is beyond the control of the manufacturer and distributor, the owner/operator assumes all risk of use. Lastly, Please Read & Understand The Following. It Will Save Both Of Us Time, Headache, & Heartache. Hi John, The 600 ESP has been hovering on a windy day in my back garden. I am very pleased with how smooth and locked in it is. This is going to make a great platform for the Bell 222. After many years flying with Futaba and Spektrum, I now fly all my helicopters with a Mikado V Control and Mikado Neo flybarless units. I also use Emcotec safety power switches on all helicopters including the 600ESP. John, I’m very grateful to have found such a great resource of knowledge and experience like you. Especially someone who sincerely cares in helping pilots like myself gain and development greater technical knowledge and skill for the fun and satisfaction of flying r/c helicopters. It would not have been possible for me to be flying my first scale ship without your help with the Phoenixtech 600ESP, electronic recommendations and tips and tricks on working with the fuselage. I will be ready to purchase from you my second 600 bird this fall for a winter build. I wanted to relay how thrilled my husband was with the 600 ESP helicopter kit I purchased from you for his birthday early last month. Thanks for shipping it out so quickly and for all the help you gave me answering all my questions before making the purchase. Most hobby shops I contacted wouldn't give me the time of day or gave me a very condescending attitude, likely because I was a woman! You on the other hand took a great deal of time explaining so much to me about bigger collective pitch RC helicopters and some of the drawbacks of giving one as a gift to someone who was still fairly new to the hobby. As you know, I took your advice into account, but still figured my husband could figure this out if he took his time. As per your recommendation, my husband found a local RC heli flier in our area for help, and he had his first successful hover this past weekend. The smile on his face when he came home was priceless. Thanks again for all your help & time. figure 8's, still getting my legs back after the crash, and still very much a newbie. Tested Captain rescue & SL, both worked great. I'm understanding more what a learning curve this hobby is. Part building confidence with flying skills, part building confidence with my mechanical set up stuff, and part building confidence with the equipment & electronics. So today everything checked out very well and so the confidence is building. Just wanted to pass along thanks for your help and having this 600 kit available. Hey John, Thanks for that partial shipping refund for the 600ESP parts I just ordered. You shouldn't have bothered as you have been so much help to me that I feel I owe you way more. From the time I ordered the kit, you have brought customer service to a whole new level! Hello John, I had my first flights over the weekend with my 600ESP and it went very well. Can't wait to get out again! Mainly, I just wanted to thank you for all the time you spent answering my "greenhorn" questions. I'm sure at times you were at your wits end with some of them, but please know that outstanding service didn't go unnoticed or unappreciated. That is something I really didn't expect at all to be honest. I've never gotten that amount of dedicated help before with any RC purchase, online or otherwise. Hey John, Just wanted to say thanks again for all the help and let you know that the Heli flies great! Hey John, Great day today and I must let you know about it! I just got back from the first three flights of the 600 ESP I purchased from you a few weeks back and could not be happier! This helicopter is everything you said it would be and more. The largest heli I have piloted up to now was a 500 and I honestly can't get over how stable and smooth this one is compared to it. I think it's even a bigger step up in stability from when I went from the 450 to the 500. I now understand first hand why you and so many others say once you fly a larger CP machine, you will most likely not go back to the smaller stuff. This was also the first helicopter kit I have ever built. I was pretty apprehensive at first, but I just followed the instructions and your videos and it went fine, very enjoyable actually. I decided to use the AR7200BX flybarless system from my Blade 450X because I'm familiar with that unit in both my 450 & 500. I'll upgrade to a more advanced unit when I feel a bit more comfortable. What are your thoughts on the new AR7210BX or should I just get a Bavarian Demon 3X or Ikon? Of course the future plan is to "skin it" as you say with a 600 size fuselage. I'm torn between the FunKey Agusta 109A (Coast Gard version) or the Bell 222 (red version). I've already told the wife one of those big boxes will be under the Christmas tree this year; she just rolls her eyes! Man I love this hobby! One of my flying buddies is very impressed with this kit as well after seeing mine fly today so don't be surprised if you see another order in the next few days from the same town. Thanks again John for bringing these 600 ESP kits in and helping us get in hot water with our wives! Hi John, Just wanted to pass along how impressed I am with this kit. 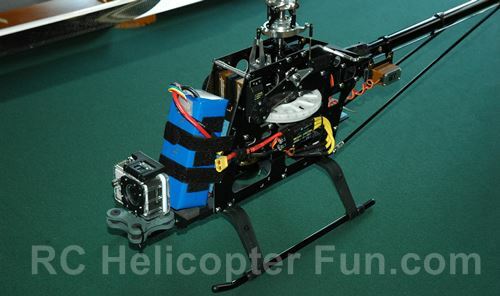 I think everyone growing in to this hobby who wants a bigger heli or heli kit should start off with your kit. All of the components fit so well and are of such good quality. I checked the blades & rotor head today for balance and both were perfect. Blades had same CG & weight. 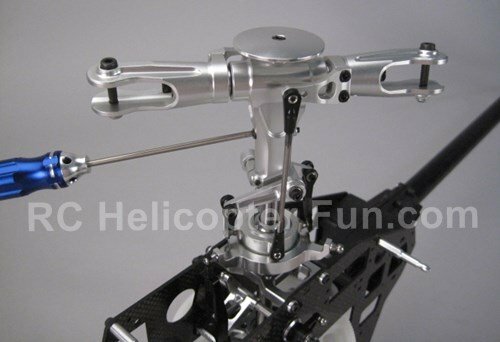 Test rotor head on Du-Bro Balancer & also was balanced. Combined with your advice for electronics, great build videos and all the additional information that you provide, this is a great value.